Arguably the most popular of all the violin concertos, Bruch�s G minor was for several years voted as the audience top choice on the Classic FM �Hall of Fame�. Today I noted on the �musica.co.uk� website that it continues to head the list of the �Top 100 Classical Works� based on data from UK performance and CD sales. 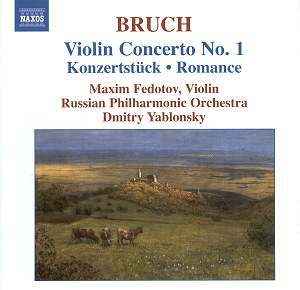 This Naxos release incorporates two of Bruch�s less familiar scores for violin and orchestra; the Konzertst�ck and the Romance. The same forces recorded for Naxos the Scottish Fantasy Op. 46 and the Serenade Op. 75 in Moscow, in 2003, on 8.557395 (see review). Today Bruch is universally known as the composer of the G minor concerto. It is generally forgotten that Bruch actually wrote three violin concertos and was, in his day, also famous for his large-scale choral works. Between 1870 and 1900 there were numerous performances of works such as the secular choral works: Odysseus, Op. 41; Das Feuerkreuz, Op. 52 and the cantatas Frithjof, Op.23 and Das Lied von der Glocke, Op. 45 earning for the composer a reputation that momentarily outshone that of Brahms. Much to the chagrin of the composer, the increasing popularity of the Concerto gradually overshadowed the vast majority of his other works. Today the two other scores of his that have remained in the modern repertoire are the Scottish Fantasy for violin and orchestra, Op. 46 and Kol Nidrei for cello and orchestra, Op. 47. Bruch was born in Cologne on 6 January 1838, in the same year as Bizet. He studied there with Ferdinand Hiller and Carl Reinecke. Extended journeys at home and abroad as a student were followed by a longer stay in Mannheim, where his opera Die Loreley was performed in 1863, a work that brought him to the attention of a wider public. Bruch's first official appointments were as Kapellmeister, first in Koblenz from 1865 to 1867, and then in Sondershausen until 1870, followed by a longer stay in Berlin and a period from 1873 to 1878 in Bonn, where he dedicated himself to composition. After a short time as director of the Sternscher Sangverein in Berlin, in 1880, he was appointed conductor of the Liverpool Philharmonic Orchestra, leaving England in 1883 to become director of the Orchester-verein in Breslau. In 1891 he moved finally to Berlin and took over master-classes in composition; Respighi being one of his pupils. Bruch retired in 1911 to devote himself to composition. He quickly became a victim of the new fashion as he was now essentially writing music in the manner of a bygone generation. Consequently the majority of his music swiftly moved into virtual obscurity. Bruch died in Berlin on 2 October 1920. The Violin Concerto No. 1 is arguably the most popular in the repertoire. In 1865 Bruch had taken up his first official position as conductor in Koblenz and by then was already determined to tackle the concerto - a form that was new to him as a composer. Bruch embarked on the Violin Concerto in the summer of 1864 with the score taking four years to write. It cost him a great deal of effort causing considerable difficulty and he had to revise the score extensively. Eminent violinist Joseph Joachim gave the first performance of the work in its final and definitive form in January 1868 in Bremen. It was soon adopted by other violinists, including Leopold Auer and Ferdinand David in Leipzig. Bruch had sought the advice of Joachim on the composition and in particular on the solo writing for the violin. Advice, not all of it acceptable, had come from Ferdinand David and also from the conductor Hermann Levi. In later years Bruch was anxious that the importance of such advice should not be exaggerated. He sold the G minor Concerto to the publisher August Cranz for 250 thalers, consequently losing the possibility of royalties; a matter of obvious later regret. The First Violin Concerto is unusual in form. With three movements, all largely in sonata-form, it opens with a Vorspiel (Prelude), the soloist entering in the sixth bar with a flourish. There is a lyrical second subject and an opportunity for technical display at the heart of the movement, before a shortened recapitulation; with a return to the music of the opening and a brief Allegro moderato that forms a link to the E flat major Adagio. There the soloist immediately announces the principal theme and, after an elaborate transition, the second theme, already heard earlier in the movement. Both themes return in the concluding section. There is a distinct Hungarian lilt to the principal theme of the final G major Allegro energico, and a suggestion of the similar figuration Brahms was to use in his own Violin Concerto ten years later. Both scores to some extent reflect the influence of the Hungarian-born Joachim, to whom both works were dedicated. In the first movement Vorspiel: Allegro moderato violinist Maxim Fedotov initially takes a deliberate approach and is rather tentative in the opening pages, gradually increasing the vigour and becoming more exhilarating. At point 00.31 Fedotov provides a strong focus to the lyrical Jewish sounding melody. Weightier rather than measured playing from Fedotov is especially noticeable between 02.06-02.25. A warm and relaxed mood is provided by Fedotov in the long melodic lines from 02.37-05.41. Noteworthy between points 06.18-06.47 and 07.47-08.33 is the wonderfully rich orchestral playing from the Russian Philharmonic Orchestra under Dmitry Yablonsky. The short cadenzas at 06.57-07.20 and at 07.29-07.47 are marvellously performed by the stylish Fedotov. In the beautiful central movement Adagio one cannot fail to be impressed by Fedotov�s playing which is strong, yet contains a tenderness that borders on the sensuous. The interpretation is never sentimental and Fedotov provides a genuine depth of passion with rapt concentration. His expressive playing, especially at 08.16-09.15 sends a shiver down the spine. Fedotov makes light work of the brilliant virtuoso passages in the development section of the Finale. Dmitry Yablonsky and his Russian players are in excellent form throughout, heard to their best effect in the delightful canonic interlude for orchestra. Throughout Fedotov displays a natural understanding of the music�s rhythmic impetus. His playing traverses a wide range of emotions, secure and spirited, passionate and moody. Yablonsky and the orchestra accompany the soloist admirably. In short this is a memorable account of a frequently recorded score, that can join the ranks of the very finest recordings. For alluring playing that is full of personality and humanity I am a strong advocate of the version from Tasmin Little with the Royal Liverpool Philharmonic Orchestra under Vernon Handley. The recording, made in Liverpool in 1991, is available on EMI Classics for Pleasure 7243-5-74941-2-0 c/w the Brahms. Another favourite version was recorded in Leipzig, in 1977, by Salvatore Accardo with the Leipzig Gewandhaus Orchestra under Kurt Masur on Philips Duo 462 167-2. This is an interpretation that sees the stylish Accardo providing vital and characterful playing. The couplings on this well packed, all Bruch, Philips Duo set are the violin concertos 2 and 3, the Serenade, Op. 75 and the Scottish Fantasy, Op. 46. Primarily for his exquisite tone and thrilling playing the historic 1962 recording from Jascha Heifetz with the New Symphony Orchestra of London under Sir Malcolm Sargent on RCA 09026 61745-2, draws considerable approval from a large group of admirers (see review of re-release). The crammed RCA disc also includes the Scottish Fantasy and Vieuxtemps� Violin Concerto No. 5. The Konzertst�ck, Op. 84, was completed in 1910. Bruch had taken the advice of Joachim's former pupil, Willy Hess, who had recently taken up a position at the Berlin Musikhochschule, on the layout of the violin part. The work seemed originally to have been intended as a fourth violin concerto, but with only two movements, linked like the first two movements of the first concerto and, indeed, like Mendelssohn's Violin Concerto in E Minor, a discernible influence on the earlier work, the title Konzertst�ck (Concert Piece) seemed preferable. It was dedicated to Hess. The first movement of the Konzertst�ck, marked Allegro appassionato, starts with an extended orchestral exposition, opening dramatically with a theme that is to form the substance of the solo entry. The soloist leads, through demanding transitional material, to a deeply felt second subject, thematic material that is to return after the display of the central development. There is a passage of greater tranquillity that forms a link with the following Adagio, ma non troppo lento, in the key of G flat major, the enharmonic equivalent of F sharp major. Here the soloist offers the principal theme, that of an Irish folk-song, �The Little Red Lark�. It is this that forms the principal thematic substance of the movement, finally bringing it to a gentle conclusion. By 1874 Bruch had completed the first movement, in A minor, of a projected second violin concerto. In the event he decided to leave it as a separate work of one movement � the A minor Romance - and the actual Second Violin Concerto was first heard in 1877 when Pablo Sarasate played it in London, while the Third Violin Concerto, expanded from an original single movement, was completed in 1891. As before, Bruch had taken advice from Joachim on the violin writing, and from Robert Heckmann, to whom the work was dedicated. The A minor Romance, Op. 42, is introduced by wind chords and the solemn notes of a solo horn, before the entry of the soloist, marked Mit einfachem Ausdruck (With simple expression). The melody returns in a lower register before the orchestra leads the way to the F major second theme, proposed with double stopping by the soloist. Both themes are to return, the first calling now for violin octaves and the second in A major, with a conclusion marked by the gentle ascent of the solo violin into the heights. Fedotov plays both the Konzertst�ck, Op. 26 and the Romance, Op. 42 with considerable assurance. He clearly knows the scores inside out and no nuance is missed or detail left untouched. There�s first class support from conductor and orchestra. Salvatore Accardo with the Leipzig Gewandhaus Orchestra under Kurt Masur have recorded excellent accounts of both works and these offer assured and poised playing (Philips Duo 462 164-2). The coupling on this generous all Bruch Philips Duo set includes the Symphonies 1-3, the Adagio appassionato, Op. 57 and In Memoriam, Op. 65. The booklet notes from Keith Anderson are as exemplary as we have come to expect and the recorded sound is of high quality. However at just over fifty minutes the total playing time is less than generous. Naxos have uncovered a real gem in violinist Maxim Fedotov and I look forward to more of his recordings of late-Romantic r�pertoire. An excellently performed and recorded release from Naxos that will provide considerable pleasure.